* 4 SEATER GOLF BUGGY PROVIDED FOR YOUR USE! Positioned on the Golf Course within the prestigious Hope Island Resort on the Gold Coast this gorgeous 3 bedroom resort style villa is perfect for families and corporates alike. 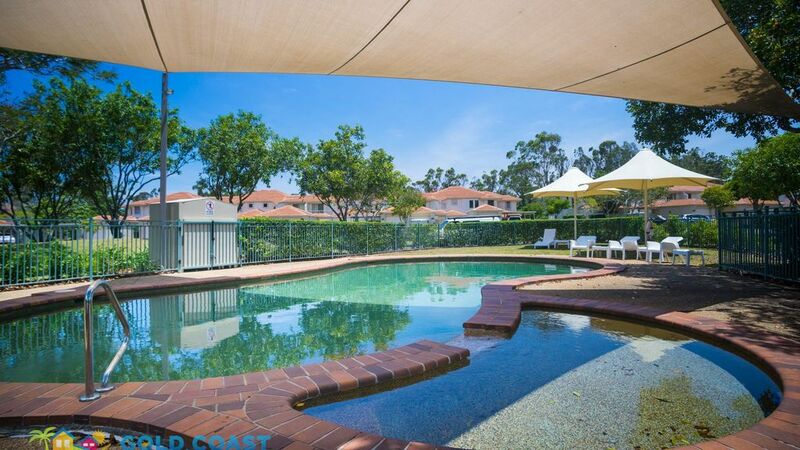 Located across from the large shaded swimming pool and 2 tennis courts there’s plenty for the kids and all within walking distance to shops and restaurants plus your only minutes from the famous Gold Coast Theme Parks. The open plan living and dining rooms have great views across the Hope Island Golf Course through the large glass doors. With a comfy leather lounge, flat screen TV and DVD player all to enjoy after a long day of sightseeing. Free WIFI internet throughout the villa. Air conditioning and ceiling fans is also included to keep everyone cool during those hot summer days. The king size master bedroom upstairs features a flat screen TV and its very own private balcony which overlooks the golf course. Great for mum and dad to relax with a glass of wine at the end of the day. The 2nd bedroom consisting of 2 single beds is also located on the upper level plus gorgeous bathroom with open shower and separate toilet. The 3rd bedrooms featuring a queen bed is located downstairs with an additional bathroom. Island Villa has a fantastic kitchen surround with think stone bench tops. Complete with quality appliances and everything you'll need to prepare a meal for the entire family. As the estate is gated with 24 hour security the kids can play safe knowing the general public cannot access this prestigious estate..
Did we mention the home also comes with a sporty 4 seater golf buggy! Leave the car behind because now you and the whole family can now get around Sanctuary Cove in style. Imagine cruising around the Marina, playing a round of golf without the need to hire a buggy or driving down to one of several shops, cafes or restaurants within Sanctuary Cove without starting your car. not too mention looking for parking. Now your really one of the locals! Close to Restaurants, coffee shops, tavern, Coles Shopping centre and world renowned Hope Island golf course. ** PLEASE NOTE** if this home is booked out over your selected dates, please let us know as we have many more luxurious homes available for you throughout the Gold Coast. Gold Coast Holiday Houses is a fully licensed boutique real estate agency specialising in luxury holiday home, villa and apartment rentals in the most exclusive areas of the Gold Coast. Our extensive portfolio of amazing properties includes everything from waterfront mansions to golf-front villas and cosy apartments, ensuring we have the right property to meet your needs and your budget. Enjoy all the fantastic attractions that the magnificent Gold Coast has to offer, and then retreat to your own private oasis and relish in the convenience of having your own facilities and luxurious space. We cater to families, groups, couples, and executive guests looking for a relaxing getaway in a first class location. All of our properties have a strict ‘no parties or commercial functions’ policy, and are not available to young groups or Schoolies.